Amr Bin al-As (or Amr ibn al-As) was a companion of Prophet Muhammad (PBUH) who is especially known for his conquest of Egypt during the caliphate of Umar bin Khattab (RA). After martyrdom of third Caliph Usman (RA), Amr sided with Muawiya bin Abi Sufiyan (RA) and became his right-hand-man. He was a great political and military figure who played very important role during earlier Muslim conquests and later for the survival and rise of first Ummayad caliph Muawiya. Amr bin al-As (RA) was born in Makkah in the Banu Sahm clan of Quraysh tribe around 585 AD. In his youth, he was a trader who had visited different trading routes in different parts of Asia and Middle East including Egypt. This experience helped him a lot in his later expeditions as a Muslim Commander. In the early days of Islam, he was an opponent of Islam like most of the people of Quraysh. He was an intelligent person who led the envoy of Quaysh in Abyssinia to bring back the emigrant Muslims but failed to do so despite his intelligence and effort. He also took part in the Battle of Uhud as a commander for Quraysh against Muslims. Soon after the Treaty of Hudaybiyya, Amr went to Madinah along with his friend Khalid bin Waleed (RA) and both of them embraced Islam in 629 AD (8 AH). It was a very pleasing moment for Prophet Muhammad (PBUH) and Muslims because both of them were great military commanders who later proved their importance in the Muslim Conquests during Caliphate. In 629, Amr (RA) led the Campaign of Dhatas Salasil and remained successful against a large army. This campaign neutralized the effects of the earlier retreat in Battle of Mutah. He also played important role in the Islamic conversion of Oman as the leaders of the nation accepted Islam when he (Amr) was sent by Prophet Muhammad (PBUH) to Oman. He was also made governor of Oman for a short period. In order to stop the Byzantines for helping their Arab allies in the north of Arabian Peninsula, Caliph Abu Bakr (RA) sent four armies on the northern borders of Arabia and Amr bin al-As was commander of one of these armies. After the Conquest of Iraq, Khalid bin Waleed joined these armies which started campaign for the Conquest of Levant (al-Sham). Amr bin al-As took part in many important battles of this conquest including Battle of Ajnadayn, Siege of Damascus and Battle of Yarmouk. After the conquest of Levant, Amr suggested the second Caliph Umar (RA) for an attack on Egypt in order to secure the western fronts from the Byzantines. Umar accepted his proposal and made him (Amr) the commander for the campaign of Egypt. There were three major battles that were fought for the Conquest of Egypt. In 640 AD, the Muslim army of 15,000 completely defeated the larger army of Byzantines at the Battle of Heliopolis which resulted in the capturing of most of Egypt. In 641 AD, Amr conquered the whole of Egypt after the successful Siege of Alexandria. In the end of 645 AD, Byzantines recaptured Alexandria but after few months, they were defeated for the last time by Amr (RA) in the Battle of Nikiou in 646 AD. For the next 500 years, Byzantines never tried to retake Egypt from Muslims. Amr (RA) founded the city of Fustat in 641 AD which was the first capital of Egypt under Muslim rule. He also built the Mosque of Amr bin al-As in Fustat which is the first Mosque not only in Egypt but also in the whole continent of Africa. 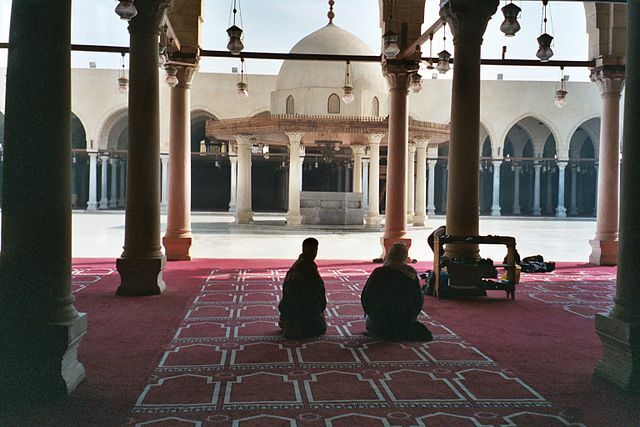 The mosque is still present in Old Cairo. After the martyrdom of third Caliph Usman (RA), the First Civil War (First Fitna) started in the Islamic world with the people of Iraq and Egypt sided with fourth Caliph Ali (RA) but the people of Hejaz (including Makkah and Mdinah) and Levant demanded punishment for the killers of Usman (RA) and refused to accept Ali as Caliph unless he punishes the culprits. Ali was able to restore his authority in Hejaz soon but the real opposition came from Levant where Usman’s cousin Muawiyah (RA) was governor who refused his removal of post from Ali (RA). At that time, Amr (RA) became the right hand man of Muawiyah and played important role during the Battle of Siffin (657 AD) which was fought between Ali and Muawiyya in Syria. First, he was able to stop the battle at a time when Ali’s success was looking close and both the sides decided to arbitrate through Holy Qur’an. Secondly, he cleverly paved the way for the rule of Muawiyah after rejecting his removal from the seat while the arbitrator from Ali’s side (Abu Musa al-Ashari) declared the removal of both Ali and Muawiya from Caliphate. Later, Ali (RA) had to face opposition from Kharijites (people among his own group). Ali crushed the rebellions of Kharijites in the Battle of Nahrawan (659 AD) but it gave enough time to Amr (RA) to retake Egypt from Ali’s governor Muhammad bin Abu Bakr in 658. Amr remained the governor of Egypt from 658 to 664 till his death. Amr bin al-As (RA) was a great Muslim military commander and politician. He conquered Egypt from the Byzantines and also played important role in the conquests of Syria and Palestine. He also played very important role during the First Fitna and the rise of Muawiyah (RA) to power is mainly based on his efforts. He is also known as one of the best governors of Egypt.